If you have ever suffered from snoring, you have probably looked into using a device to try to stop snoring. There are dozens of great devices available on the market. Unfortunately, the Snore-B-Gone is not one of them. Snore-B-Gone is the single worst snoring device and company I’ve ever seen trying to sell an OTC snoring device. I am shocked this misleading and dangerous product continues to be sold to unsuspecting customers who may be unaware of just how truly terrible this product is. This review should serve as a warning to all customers or potential customers: this is a dangerous product sold by an unscrupulous company that is unsafe and does not match up to the claims it makes on its website in any way. Do not purchase this product! The company that produces Snore-B-Gone shows images on its website of an adjustable device that is similar to the SnoreRx mandibular adjustment device. I was excited to try this product because SnoreRx is the only other device that can adjust the mandibular lower jaw forward in increments by millimeter. As anyone who snores and has tried anti-snoring devices knows, making small incremental adjustments to the position of the jaw is critical for comfort. I had heard that SnoreRx has a patent or patent-pending on this type of incremental adjustment to the jaw, so I wasn’t sure how Snore-B-Gone was going to get around that. However, my curiosity got the better of me, and I ordered one through their site with the idea that I should try it out and give it a thorough review. The first red flag I was able to see about the Snore-B-Gone product was that they sell it as a one-month supply. This is a total scam when you compare it to just about any other device to help you stop snoring that is available on the market. Any of the quality anti snoring devices will work for between 6 and 10 months, depending on the material from which it is constructed and how well it is cleaned and cared for. What is perhaps even worse, this company is trying to trick consumers into buying a 2 or 3-month supply upfront for over $120. This traps the consumer into using a poorer quality and more expensive device for a longer period. For these reasons, I was apprehensive when ordering this device. I ordered the one-month supply, knowing this should last for much longer and hoping it would be of a good enough quality to last for several more months after that. Unfortunately, it was of extremely poor quality, and I was disappointed with it: it almost certainly would not have lasted the month, let alone several months. A “one month” supply of the Snore-B-Gone device cost $60. This is a price that is competitive to other snoring mouthpiece costs, albeit ones that offer much higher quality in materials and construction at that price point. I also noticed that nowhere on the site does it say that the product is made in the USA or that it uses BPA-free or medical grade materials. This is a big red flag for consumers, especially since this device is placed in the mouth and could leach harmful chemicals. We don’t even know what materials the device is made of, let alone where it was made or under what safety conditions. Most worrisome of all, this product does not have FDA certification or clearance. In short, you simply have no idea what you are getting or if it is safe to be used! Unsuspecting consumers who purchase and use this product could be putting harmful or dangerous chemicals in their mouth at night and exposing themselves to carcinogens, toxins, and other unknown substances as well. I was excited to open the box when the device arrived in the mail. I was curious to see if the device would be well-constructed and how easy it would be to use. However, when the parcel arrived, I had the shock of my life. When I opened the box, I was disappointed to notice the device is not adjustable in any way. It is not at all what the website advertises, and certainly nothing that is comparable to the SnoreRx or any other contemporary anti-snoring device that would be recommended by a physician, sleep specialist, or other health professional. 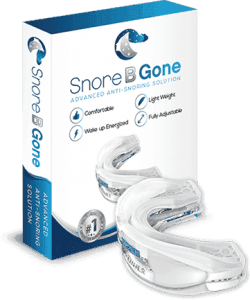 The Snore-B-Gone is simply a cheap knockoff of an old snoring mouthpiece design that was popular 15-20 years ago. No one in health or sleep science today would ever recommend the use of this device because it is not based on the most current scientific knowledge that we have about the anatomy and physiology of snoring. More than anything else, I couldn’t believe they would ship a completely different product then they advertised on their site. Anyone who buys this is going to be very disappointed. I did a little online research about this device and where to find it. I was disappointed but unsurprised to discover the same device can be purchased for less than $1 each from Chinese e-commerce sites such as Alibaba. It became completely obvious to me what this company is doing. They are buying these cheap devices in bulk from manufacturers in China and then re-selling them to unsuspecting consumers in the United States at an exponentially increased cost, and pocketing the profits. 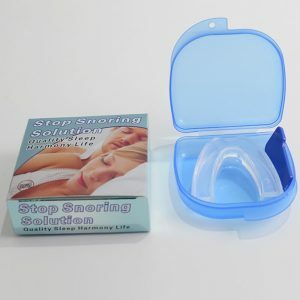 The actual name of the product that is being sold is “The Best Solution to Stop Snoring.” It is simply a cheap plastic knock-off that is very likely made in China with no oversight into its design or the safety of the chemicals, preservatives, and softeners used in the construction of its plastic components. I didn’t even try to test wearing this in my mouth to see if it works. Not even for a minute, and certainly not overnight. It is such a cheap knock-off of an AirSnore or Therasnore that I didn’t want to risk it. Who knows what damage you could be doing to your body, mouth, gums, and overall health with this unsafe and unregulated product. The Snore-B-Gone does not meet its online description or the promises made on its website. It does not even meet the bare minimum standards for safety or medical use in the United States. This product is simply someone trying to put lipstick on a pig by marketing a beautiful e-commerce site that sells a shady, unregulated product.